I love steak. I do. I can think of no better way than spending an evening with a great selection of excellent red meats in a seriously cool setting with cocktails and carnivores in every square inch of your view. 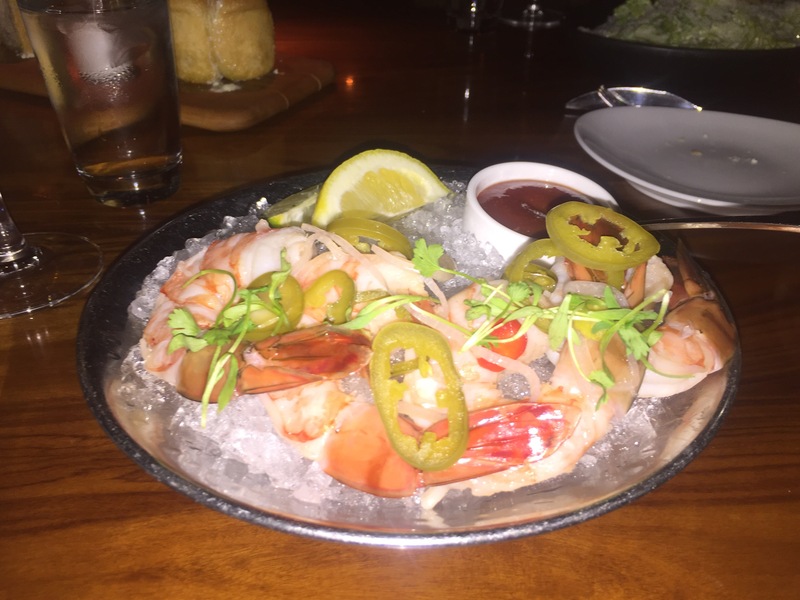 There are few places that can do it half as well as STK in Vegas. I appreciate that some people don’t get quite as excited about beef as I do and so for all you iron-deficient pale people, they also have a pretty wonderful selection of seafood, fish and chicken. I wont walk you through the vegetarian dishes as it seems like sacrilege but I will mention some sides. That said, if you are a vegan, probs better for you to either go to a vegan restaurant or order yourself a little box of sawdust from Homebase. I have been to the STK in London a number of times, and this one in the middle of the Cosmopolitan Hotel just screams cool before you even arrive. It’s young, it’s trendy, it’s very much a party vibe. The meal starts with their delicious pull-apart bread, served with bleu cheese butter and chive oil. For me, if I am using up “steak room” with bread… It had better be worth it. Tick. 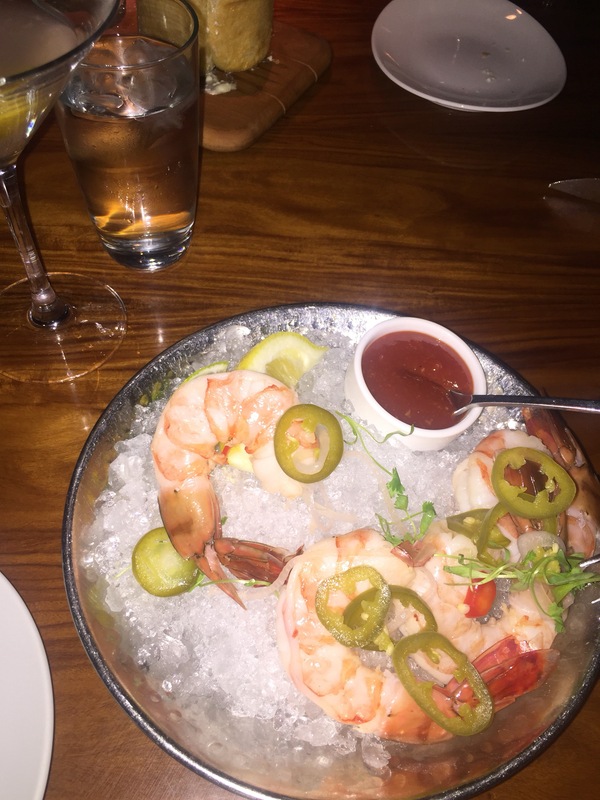 For my starter, I had the Shrimp cocktail with cocktail sauce & lemon. Shrimp? Lets be honest… these are not shrimp. Given a large body of water, I could have thrown on a harness and ridden these back to the open waters. My guests had the Beef Carpaccio… Or as I like to call it… The Kaleidoscope of delicious… (You can steal that if you like)… Served with aged balsamic, pesto noodles & parmesan. We also had the Beet salad with arugula, pistachio pesto & goat cheese. For mains, one of my guests opted (controversially) for the Seared big eye tuna with wasabi potato, maitake & sweet miso jus. It was perfectly seared and the wasabi potato was a really nice, flavoursome touch. Look, its not that I don’t like tuna. I like seared tuna as much as the next girl, but when the calibre of steak is this high, frankly tuna or any other fish can do one and I want no part of it. Then…. The Steak. My God. One of my group went for the Bone-in filet. The perfect choice for a “fair-weather” meat eater and looked amazing. Don’t get me wrong. Fillets are the softest cut and definitely very popular, but in terms of flavour & dominance, if they were famous siblings, then the fillet is the Eric Roberts to the Rib-Eyed Julia. Equally nice to look at but just doesn’t carry as much clout and power. In this analogy, I opted for the Julia in the form of the Bone-in rib steak, which was incredible and I opted for the additional jalapeno onions and bearnaise sauce. Frankly, after the prawns, and being the meat loving Greek that I am, I almost ended up in competitive eating mode in order to savour this fantastic piece of meat, but it was just too good not to devour. The 4th of my group had the Free range chicken with polenta fries, smoked tomato whiskey & haricot vert. This had a surprising amount of flavour and punch in a steak restaurant and held its own well as a chicken dish. The sides are incredibly substantial and classic comforts. We opted for the Sweet corn pudding and the Parmesan truffle fries. Next, I have only two words: Mac & Cheese. Decadently good and frankly worth any sort of palpitations that you may get as a result. If you cant handle the meat narcolepsy, get out of the kitchen. It is Too good to miss. Dessert was a selection of fab Ice Creams: Chocolate Brownie, Coconut & Birthday Cake flavoured. Alternatively, try the Cinnamon & Churro Milkshake. While I love steak, I have VERY high expectations with it. In a restaurant that is named after one dish only… it is lucky for them (and me) that they are so fantastically good at delivering!